Windows Azure Hyper-V Recovery Manager Service protects your on-prem applications by orchestrating the protection and recovery of Hyper-V Virtual Machines running in a private cloud (i.e. System Center Virtual Machine Manager 2012 R2 or System Center Virtual Machine Manager 2012 SP1) to a secondary location. 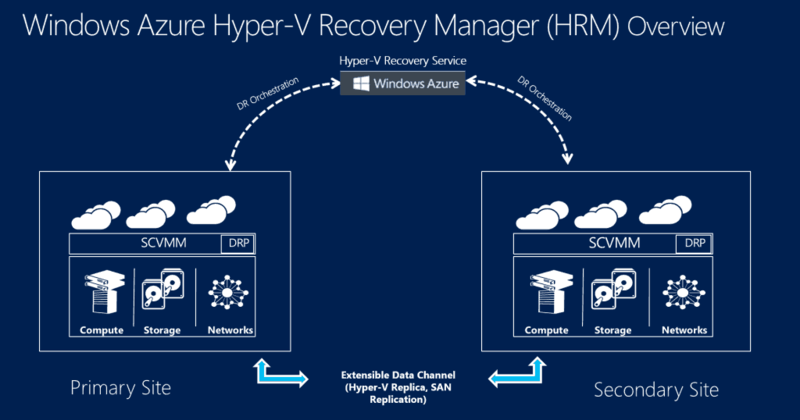 Hyper-V Recovery Manager leverages the capabilities of Hyper-V Replica to provide on-going replication of Virtual machines. The service also monitors for changes like VM migration, additions of new clusters, changes in network setting – and it automatically re-configures VM protection if needed. This ensures that Virtual Machines remain protected throughout the lifecycle without manual intervention. Hyper-V Recovery Manager can be accessed via the Windows Azure Portal from any internet-enabled device. VM protection status can also be remotely monitored and, in the event of an unforeseen disaster, customers can begin the recovery operations remotely. Cloud-based Recovery Plans enables automated DR orchestration by sequencing the failover of different groups of Virtual Machines. For example: In a multi-tiered application you can arrange the Database tier, middle tier, and web tier in different groups within a Recovery Plan and sequence it such that the database tier fails over and boots upbefore the other tiers. Additionally, recovery plans can be customized with scripts and manual actions. For example, one can combine a SQL Always On failover PowerShell script with a Hyper-V Recovery Manager Recovery Plan for application-specific DR operations. Windows Azure Hyper-V Recovery Manager can be accessed by licensed Windows Azure admin using the Windows Azure Management Portal (https://manage.windowsazure.com/) under Data Services\Recovery Services. I know you are providing excellent service that we are using your services for our fire and water damage restoration purpose because i have never seen such as good and fast services before today,. wp are software to in this site Multi-level ivr plugin to Vocie Response Plugin Is A Multi Level IVR Plugin which comes with complete IVR Solutions to fullfill all of your ..
Well written post. I appreciate your guidance for sharing about HyperV . I really need to know about it. Great work!